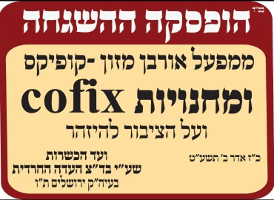 "The Badatz Eida Chareidis announced that it is no longer providing kashrus certification for some Cofix stores and the factory." "While most Cofix stores around Israel are not under the badatz’s certification, some are, and this will have a profound impact on those stores, located in frum communities." "Belgium’s Constitutional Court on Thursday questioned the legality of the ban on religious slaughter passed in 2017 by the parliaments of Flanders and Wallonia." "Practically speaking, the court's decision is an interim one, which shows it is seriously considering the legal challenge, but has not reached a final decision - a result which disappointed Jewish groups who had hoped to already erase the law from the record books. " "Following the passing of the law, the Coordinating Committee of Jewish Organizations in Belgium (CCOJB) filed a lawsuit against the ban with support from The Lawfare Project, a legal think tank and litigation fund that files legal cases against anti-Jewish discrimination around the world." "The Belgian court decided that it needs to check whether the bans on religious slaughter are compatible with European law." "According to those suing to strike the law, European legislation allows for religious slaughter as an exception to the rule of prior stunning, provided that religious slaughter is operated in an approved slaughterhouse." "CCOJB and The Lawfare Project 'maintain that while the ban was implemented with the stated purpose of animal welfare, that argument is flawed because animal welfare has always been central to the laws of kosher practice.'" "Terms such as “veggie burger “and “vegan sausage” could be banned under new plans put forward by the European Parliaments Agriculture Committee. Names that are currently used for meat products and meat preparations shall under this plan be reserved exclusively for products containing meat, for instance, designations include steak, sausage, escalope, burger and hamburger. This follows a previous 2017 judgment on purely plant-based products not being allowed to be marketed with designations such as 'milk,' 'cream,' 'butter,' 'cheese' or 'yogurt.'" "The issue of how to label plant-based products that do not contain any meat or dairy continues to be in the spotlight on both sides of the Atlantic. The issue of designation is obviously important to both industry and consumers and any judgment has wide implications for the food industry, particularly innovators in the meat analog and plant-based spaces. " "The significance of the shift to plant-based meat is underscored by key players moving into the space. For instance, Burger King is trialing Impossible Foods’ meatless patties in restaurants in St. Louis, US, while Nestlé has made its latest foray into the meat-free market, launching a new 'cook from raw' plant-based burger for European markets, while also unveiling launch plans for the US later this year." "The amendment, which was adopted by the Agriculture Committee earlier this week, says: 'Names that fall under Article 17 of Regulation (EU) No 1169/2011 that are currently used for meat products and meat preparations shall be reserved exclusively for products containing meat. Poultry products and cuts defined in Regulation (EU) No 543/2008, which lays down detailed rules for the application of Council Regulation (EU) No 1234/2007 as regards the marketing standards for poultry meat shall be reserved exclusively for edible parts of the animals and products containing poultry meat.'" "The text approved now has to be scrutinized by the Parliament as a whole. This can happen only after the 23-26 May European elections." "Single-use plastic items such as straws, forks and knives as well as cotton buds will be banned in the European Union by 2021 following a vote by EU lawmakers on Wednesday as the bloc pushes manufacturers to step up their recycling efforts. " "Growing concerns about plastic pollution in oceans and stories of dead whales with plastic in their stomachs, together with China’s decision to stop processing waste have prompted the EU to take more drastic steps to tackle the issue. " "The European Parliament voted by 560 to 35 in favor of banning 10 single-use plastics including plates, balloon sticks, food and beverage containers made of expanded polystyrene and all products made of oxo-degradable plastic. These are the 10 most found items on EU beaches. " "EU countries can choose their own methods of reducing the use of other single-use plastics such as takeout containers and cups for beverages. They will also have to collect and recycle at least 90 percent of beverage bottles by 2029. "The EU recycles only a quarter of the 25 million tonnes of plastics waste it produces per year. Single-use plastics are disposable plastic-made products that are designed to be used only once over a short time span before being thrown away. " "The New York legislature has reached a deal to ban single-use plastic grocery bags, reports CNN. The law that is expected to pass as part of the 2020 budget, would prohibit grocery stores from providing plastic bags for most purchases, with exceptions for plastic carryout bags, dry cleaning, and plastic bags for fruits and vegetables at the grocery store." "The ban, which would become effective March 2020, would allow local governments to impose a 5-cent fee on paper bags. Forty percent of the revenue generated by the fee would support 'local programs to buy reusable bags for low and fixed income consumers.'" "The City Council on Thursday voted to make low-sugar drinks the default beverage in children's meals at restaurants citywide in an effort to curb childhood obesity and diabetes." "If signed into law by the mayor, chain restaurants must offer water, low-fat milk or 100% fruit or vegetable juice as the standard option rather than sodas or other drinks with added sugar." "Public health advocates and the city Health Department supported the bill during a City Council hearing last month. The Health Department has described reducing the consumption of sugary beverages as a top agency priority. Nearly 1 in 5 children ages 6 to 19 are obese citywide." "Nearly three decades after a U.S. state last imposed a special tax on sugary drinks, Connecticut’s governor is pushing for one to help close a budget deficit — and bracing for a fight." Taxes on soda and other sugar-loaded drinks have taken effect in recent years in several cities around the country, but lobbying from the beverage industry and its allies has been credited with helping to block statewide proposals that emerge annually in state legislatures around the country." "Ned Lamont, a Democrat, who included 1.5-cent-per-ounce tax on sugar-sweetened drinks in his budget proposal." "Connecticut is among several states likely to see debate renewed this year over taxes that advocates endorse as a way to reduce consumption of liquid calories blamed for contributing to health problems such as obesity and diabetes. Opponents argue the taxes hurt stores and supermarkets as well as beverage producers, while inflicting financial harm on consumers." "Statewide taxes on sugary drinks were proposed this year in states including New York, Massachusetts, Rhode Island, Vermont and California, but the last state to impose any such tax was Arkansas, which adopted an excise tax on soft drinks in 1992. Three other states have had sugary drink taxes on their books for decades — Tennessee, Virginia, and West Virginia, according to the National Conference of State Legislatures. Dozens of other states apply sales tax on at least some soda purchases." "Advocates on either side have cited studies with different conclusions on the effectiveness of taxes for public health. A 2017 report from Healthy Food America said sugary drink sales in Mexico dropped 9 percent two years after that country imposed a tax, while they dropped 10 percent one year after Berkeley, California, adopted such a tax. But the American Beverage Association says other research, including a 2017 study of Philadelphia’s soda tax commissioned by the industry and conducted by Oxford Economics, challenges that argument. It notes consumers shifted grocery buying trips outside the city to avoid the tax, or purchased untaxed substitute items, such as drink mixes." "In Connecticut, which is facing a two-year budget deficit of about $3.7 billion, Lamont’s office estimated the tax on sugary drinks would generate $163 million in new annual revenue." "Cities have had more success passing taxes. Municipal taxes on sugary drinks were implemented in four California cities, including San Francisco and Berkeley, as well as Philadelphia, Seattle, Boulder, and the Navajo Nation, according to Healthy Food America. The most recent are San Francisco and Seattle, which took effect in January 2018. A penny-per-ounce tax in Cook County, Illinois, was repealed in 2017 following lawsuits, a warning that millions in federal food stamp benefits could be lost and complaints by store owners about plummeting sales." "The beverage industry has tried to slow the expansion of local soda taxes by supporting efforts at the state level to ban local taxes. Arizona, Michigan, California and Washington each passed legislation or referendums that banned local taxes on drinks. In Washington, the Yes to Affordable Groceries campaign, funded almost entirely by the soda industry, raised more than $20 million to pass a measure last year prohibiting new local taxes on soda or groceries." "While lawyers continue talking in Missouri, lawmakers in at least three more states have passed bills to legally prohibit 'mislabeling' of food products derived from animal cultures, plants or insects as meat. Mississippi Gov, Phil Bryant, and South Dakota Gov. Kristi Noem, both Republicans, have already signed bills overwhelming passed by their Legislatures, into law. In Montana, the 'Real Meat Act' is awaiting Democratic Gov. Steve Bullock’s signature. "Other bills limiting what can be labeled as meat are under consideration in Arizona, Arkansas, Colorado, Illinois, Indiana, Nebraska, North Dakota, Virginia, Washington, and Wyoming." "Missouri was the first state to prohibit plant and lab-grown alternatives from labeling those products as meat. The cell-cultured industry immediately took Missouri to court in a case known as Turtle Island Foods v. Missouri." "The lawsuit, filed in U.S.District Court for Western Missouri, was expected to be a battle royal, but ACLU attorney Anthony E. Rothert and Deputy Missouri Solicitor General Julie Marie Blake announced two months ago that they’d reached a settlement." "On April 1, Rothert and Blake again told federal Judge Fernando J. Gaitan, Jr. that they have a “tentative settlement” in Turtle Foods V. Missouri, but they still need more time. “The parties are working diligently to execute a final settlement agreement, however, more time is needed to (1) continue to work on the proposed language, and (2) get formal approval from all necessary government officials,” their status report to judge says." "Judge Gaitan gave the parties until May 1, 2019, as a new deadline." "Montana’s Real Meat Act was sponsored by Rep. Alan Redfield, R-Livingston. He said Montana have a right to know that they are buying and where it came from. The Real Meat Act does not ban the sale of cell-cultured products but prohibits them from being labeled as meat." "The Montana Real Meat Act also does not focus on the veggie burgers or plant-based alternatives like Beyond Meat. Meat is defined as that which is derived from the edible flesh of livestock or livestock product." "'Cell-cultured edible product,' the Montana bill says, 'is derived from muscle cells, fat cells, connective tissues, blood and other components produced via cell culture rather than from a whole slaughtered animal. Such a product must contain labeling indicating it is derived from those cells, tissues, blood or components.'" "Further, it says that hamburger or ground beef means ground flesh or frozen beef, or a combination of both, with or without the addition of suet, to which no water, binders, or extenders are added. Hamburger and ground beef are terms that do not include cell-cultured edible products, according to the Montana bill." "Montana’s livestock herds account for about one-third of it’s total agricultural GNP." "The new South Dakota law prohibits “fake meat” from being misbranded or intentionally mislabeled. False, deceptive and misleading labeling is prohibited. "Likewise, the new labeling law that passed the Mississippi Legislature unanimously says food products that contain cultured animal tissue produced from cell cultures outside of the organism from which it is derived shall not be labeled as meat or a meat food product." "Further plant-based, insect-based food products also cannot be labeled as meat or meat food products for related purposes." "Bnei Brak’s Rabbi Moshe Yehuda Leib Landau passed away Saturday evening at the age of 84." "Rabbi Landau was hospitalized earlier this week, after being diagnosed with an infection." "Rabbi Landau, who succeeded his father as Bnei Brak’s rabbi, served in the position for 32 years." "His position included handling the city’s religious issues, including marriages, eruvs (boundaries which allow things to be carried on the Sabbath and holidays), and mikvahs (ritual baths). He also gave lectures on various topics in Jewish law at the city’s synagogues." "One of Rabbi Landau’s specialties was kashrut (kosher food), and he ran one of the most well-respected kashrut supervision organizations." "Quebec has introduced a bill that bans some public employees from wearing religious symbols at work, including kippahs." "The measure is intended to reinforce the separation of church and state, but critics say the real target appears to be Muslim women who wear hijabs covering their hair and necks." "The Quebec parliament pushed ahead with the “secularism bill” on Thursday introduced by the right-leaning coalition government of Premier Francois Legault." "Among those who would be affected are teachers, police officers and judges. Along with kippahs and hijabs, Sikh turbans and crucifixes would be prohibited." "Polls show most Quebecers supporting the legislation." "As an apparent sop to critics, the legislation has a grandfather clause that allows workers who now wear religious symbols to keep them on, and will remove a prominent historical crucifix in Quebec’s National Assembly. But new public workers in “authority” positions could not wear religious symbols — they risk dismissal if they do not follow the ban." "In October 2017, Quebec’s previous Liberal government passed a bill banning face coverings for those receiving public services."